energyOrbit mobile is designed from the start to complement the energyOrbit program tools and to extend that capability to a mobile workforce. 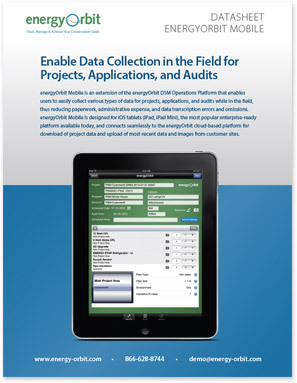 Our mobile solution provides an optimized yet flexible data collection platform that leverages the intuitive iOS interface to speed data entry in the field and virtually eliminate keying in project data when reps return to the office. The energyOrbit mobile solution can be configured to support various field processes and program delivery models. At its core, the energyOrbit mobile app collects project data and reliably transmits that back to energyOrbit for use in the office. This basic capability can be configured to support various program types: from recording tallies for high volume direct install efforts to detailed information collection for audit and custom incentive programs. These capabilities can be configured to support both internal staff and program partners on either company-owned devices or personally-owned equipment. energyOrbit mobile can be configured to collect a wide range of information about each project in the field: measure data and measure-specific values, notes about each measure, photos of the facility and specific measures taken on site with the device or imported from the device Camera Roll, answers to pre-configured survey questions, and free-form notes to support project, lead generation, and evaluation efforts. All of the information collected in the field is reliably transmitted back to energyOrbit for further processing or reporting. A unique feature of energyOrbit mobile is its ability to work offline, when an Internet connection is not available. Unlike most Internet-enabled apps, energyOrbit mobile can download a package of work to be completed while offline in the field, automatically uploading data when a connection is available. This feature ensures that field crews can continue to be productive regardless of their location. All of the features in energyOrbit mobile can be configured by program management staff: from available measures to survey questions and response choices. 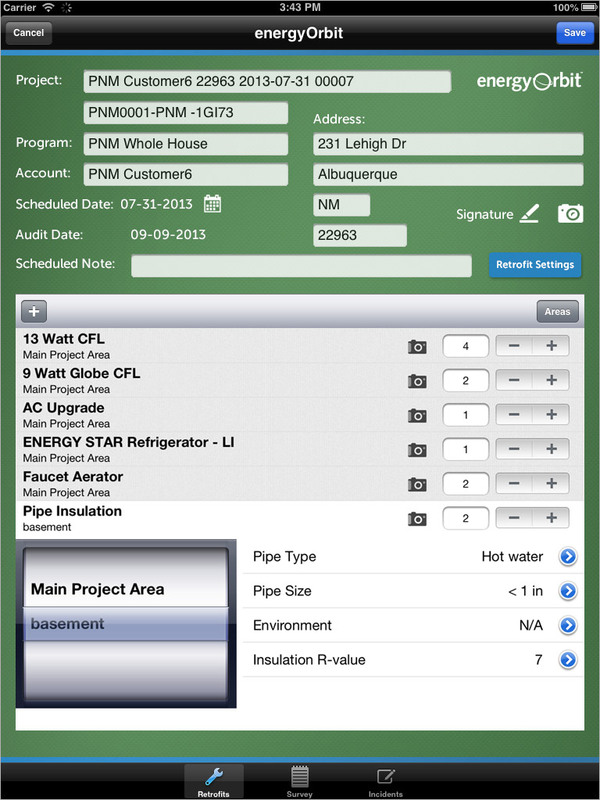 Our app provides a natural extension of the online system for managing project data. Data security is ensured by requiring active credentials to the energyOrbit system when downloading project data. Completed project information is returned to energyOrbit using industry standard encryption protocols. Customer information is not retained on the device after each work batch is closed, further increasing the security of the mobile solution. energyOrbit Mobile is the ideal complement to the energyOrbit system - extending the reach and mobility of program staff by providing a reliable data collection platform for program efforts. Configurable, Intuitive, and Secure: energyOrbit mobile is designed to take program implementation efficiency to a whole new level.